For at least 15 years, M*A*S*H fans have wondered about the existence of a bit of TV footage in which McLean Stevenson sat on a raft and shouted “I’m okay! I’m okay!” Supposedly, it aired at the start of an episode of The Carol Burnett Show the day after “Abyssinia, Henry” was originally broadcast back in May March 1975. Or so one version of the story goes. Other versions claim it was an episode of Tony Orlando & Dawn or The Tonight Show Starring Johnny Carson. I looked into the rumor back in June 2011 and was only able to determine that if it was The Carol Burnett Show it couldn’t have aired the day after “Abyssinia, Henry” because The Carol Burnett Show was seen on Saturdays while M*A*S*H aired on Tuesdays during the 1974-1975 season. Truthfully, I wasn’t convinced it ever really happened. So when did this footage air? During the Sunday, May 4th, 1975 episode of Cher’s CBS variety show, which was called Cher. McLean Stevenson was the special guest that week. In addition to his brief raft appearance, he was also in two full sketches. Why do so many people seem to remember seeing something like this on The Carol Burnett Show? I don’t know. I suppose it’s possible McLean Stevenson did something similiar on The Carol Burnett Show. It’s equally likely that someone remembered seeing the raft gag but got confused and thought it was an episode of The Carol Burnett Show and not Cher. Once the misinformation made its way online it spread and eventually was taken as fact. If you’re curious how I got my hands on this footage, here’s what happened. A few weeks ago, I received an e-mail from someone saying they had the episode of Cher on DVD. Apparently, the series aired on VH-1 at some point during the 1990s (originally an hour long, the VH-1 episodes are cut down to 30 minutes). He offered to send me a copy. I eagerly accepted but was torn. On the one hand, I was excited to finally see the footage. On the other hand, it seemed too good to be true. Could this really be it? 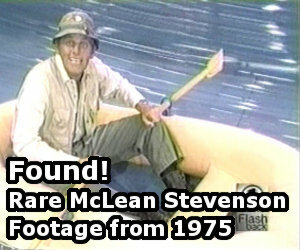 At first, after watching the episode in question, I couldn’t find the footage of McLean Stevenson on a raft. He was definitely in the episode, part of a bizarre sketch involving mice. I took a closer look and there it was. The timing was perfect. The 41st anniversary of “Abyssinia, Henry” was only days away. What better time to post the video and finally confirm once and for all that it really happened? Let’s all say a big thank you to the M*A*S*H and Cher fan who provided the DVD. And floors were waxed so I grabbed the 12 foot Cypress Door. Was only 30 pounds are less and it moved faster then me and when it slammed sounded like a huge cannon. My uncle took his mom an aunt to floor from shell shocked. To all cast living when hot lips was queen of Argus. She was sweet kind and answered all my questions and took time for a teenager to understand why mash was done the way it was. Thank you Ms Lorreta. The archbishop Hannon wore combat boots I can read Grim reaper. One police plaza. And it’s hard but God knows we’re he is Brother. That was the first time I ever tasted host dunked in wine. An being non drinker it was bitter wine. And for people with throat trouble you don’t choke. Wow i can’t believe you found this clip. I’ve never seen it but I remember my parents and or aunt and uncles talking about it. Everybody was sad when Colonel Blake died and this clip was pretty cool got everyone to see. I saw the episode again Abyssinia Henry for the umteeth time and just wondered about the clip. After all these years I finally got to see it. yeah it’s a nice piece of cake! When trappers and hawk guy are in the office of the black market guy there is a calender on the wall. Assuming that it is a 1950 calender and that it is open to the correct month , you can clearly see that the first day of the month on the calender is a Wednesday ,and that there 31 days in that month.